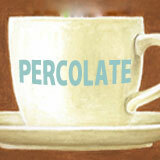 Hello and welcome PERCOLATE DAILY! I am so glad you are here with me percolating and being our best. I hope you follow along with me each day. Consider using a journal to write down your thoughts as we go. Grab your favorite cup of coffee, tea, water, juice…. whatever helps you bring your best, authentic you to the world! I will make several references to PERCOLATE and The Percolate Process. I also welcome your comments and I’m sure others would appreciate them too. PERCOLATE – Let Your Best Self Filter Through!